Agilent Technologies have introduced a million-bit-per-minute signal integrity channel simulator for multigigabit chip-to-chip data link design. 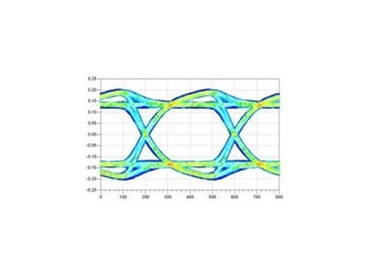 The channel simulator, a part of Agilent Technologies Advanced Design System (ADS) EDA software platform allows interactive eye measurement from channel simulations inside the ADS signal integrity design and analysis environment. According to Agilent Technologies, with higher throughput, changes can be made to the channel or the transmit-and-receive equalisation and users can see eye measurement results instantaneously. The channel simulator allows customers to build the model from regular ADS circuit and physical-level components. Users can access tuning, optimisation and batch mode from an intuitive user interface. The common applications for the ADS channel simulator are design and verification of chip-to-chip multigigabit/s serial links. These are found in consumer and enterprise digital products such as laptop computers, data centre servers, telecommunication switching centres and Internet routers. When these links operate at high data rates, signal-integrity engineers must take into account physical phenomena such as impedance mismatch, reflections, electromagnetic coupling, cross-talk and microwave frequency attenuation caused by the skin effect and dielectric loss tangent. The ADS channel simulator allows signal integrity engineers to address these challenges by performing "what-if" design space exploration. To aid this workflow, the ADS channel simulator uses impulse response analysis to automatically extract a fast, linear FIR model from any combination of ADS circuit-level and physical-level components. This results in simulation throughputs of more than a million bits per minute. Fast eye measurement lets signal-integrity engineers to produce the resulting eye measurements and optimise transmit and receive equalisation in serial links such as PCI Express(r), USB 3.0 and 10-gigabit Ethernet. Agilent Technologies’ advanced design system is an electronic design automation platform. It offers integration to designers of multigigabit/s serial links, consumer and commercial wireless electronic products, such as mobile phones, wireless networking and GPS or radar and satellite communications systems.